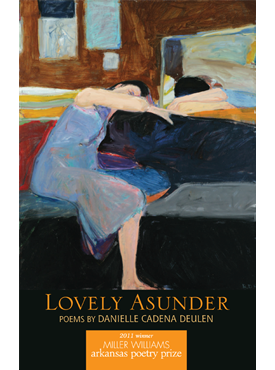 Danielle Cadena Deulen’s debut collection, Lovely Asunder, is filled with beautiful dangers. These poems, sharp and graceful, brutal and vulnerable, create from language a kind of chiaroscuro-both light and dark made more vivid by their juxtaposition. Throughout the collection, the poet appraises ancient myths through a feminine and feminist perspective, evincing the ways in which narratives transform personal experience and vice versa. The figure of the fruit, in all its implied and literal lushness, recurs like a chorus, and the speakers of these poems are haunted by the Fall-confined by the body, the mind, and the irrevocable past. Yet there is a certain abundance to Deulen’s style that keeps darkness or mere cynicism from overwhelming-a distinctly maximalist aesthetic that echoes the lost paradisal opulence for which the speakers of the poems yearn. Worldly but never mundane, this collection exists in the boundary between the physical and metaphysical, revering both. Danielle Cadena Deulen is a PhD candidate in English at the University of Utah. Her book of essays, The Riots, is the winner of the 2010 AWP Award Series in Creative Nonfiction and is published by the University of Georgia Press. Danielle Deulen & Max Stinson host the podcast “Lit From the Basement” at Vita Readings.